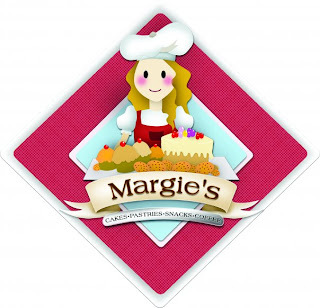 I started to love Margie's Bakeshop when a friend introduced me to her favorite Margie's cake, the Cookie Monster. I was thinking of a cake full of cookies and all. Haha! My bad, it's a 2-layered chocolate cake and if you will take a look on it, it's just a plain chocolate cake with a plain texture. So, I decided to buy one as a gift for my best friend. She love it! We love it. Now, it's our favorite cake from Margie's Bakeshop. How it Saves Money and Satisfies Tummy? Simple. If you want to just have a cup of coffee and a slice of cake, try Margie's Bakeshop located in Fairlanes Compound, F. Torres St.
For 35php you can enjoy a hot cup of coffee with flavor choices of Americano, Cappuccino, and Mocha (I think. I forgot haha). Then choose a slice of cake for 65php like the Cookie Monster slice or you can just choose the 2-layered mini cake for just 150php. 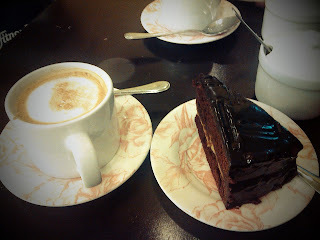 A cup of Cappuccino and a slice of Cookie Monster for only 100php! They also have various cakes to choose from Sans Rival, Chocolate Mousse, Blueberry Cheesecake, Boston Cream cake, Chocolate Expresso cake and many more. In Davao, you can also visit their branches in Abreeza Ayala Malls; Jatel Bldg., Tulip Drive, Ecoland, Matina, and Damosa, Lanang.